Savvy Spending: Disney Movie Rewards: Earn FREE Points with 25 Days of Christmas! Plus another bonus 15 points! Disney Movie Rewards: Earn FREE Points with 25 Days of Christmas! Plus another bonus 15 points! You can also use code PEACE for 5 points- this code is valid through 12/25! And before 12/23 use codes FROST and SPECTACULAR for another 5 points per code! Use codes SNOWGLOBE and JACKS to score a total of 14 FREE Disney Movie Rewards points – 7 points per code! You can also play the Ralph Breaks the Internet Quiz - 5 free points! 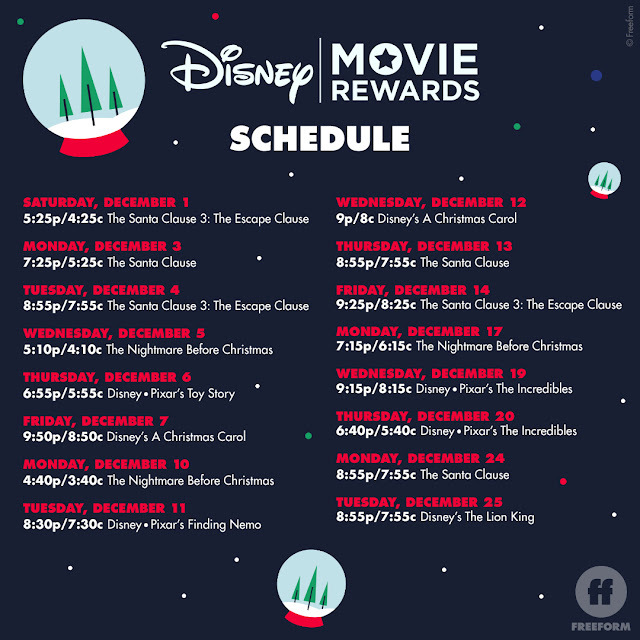 Disney Movie Rewards has teamed up with Freeform to offer 25 Days of Christmas! Sign up for Disney Movie Rewards (it's free). This is a great way to earn freebies with the free codes they put out which you can redeem for prizes! Watch the Freeform movies shown in the schedule below. Then go to www.DMRHoliday.com to sign in and enter the daily code.